This week I decided to make my soya candles and it was so easy! Let’s not waste time – here is a tutorial below. It took me about 45 minutes to make all three and that is with all the fiddling for the first one. I could probably do it in 30 minutes now. Pour the wax into a china teacup and give it away as a gift. Simple, pretty and economical. I bought 1kg of candle wax, various fragances and 2 colours and it cost £20.00. I made three candles with 500g of soya wax. But one of the jars used almost twice as much wax as the tea cup candles did so I figure about £2.50 per candle (not including the tea cups bought on eBay ages ago). And here are my completed candles … they are burning quite nicely as I write this. 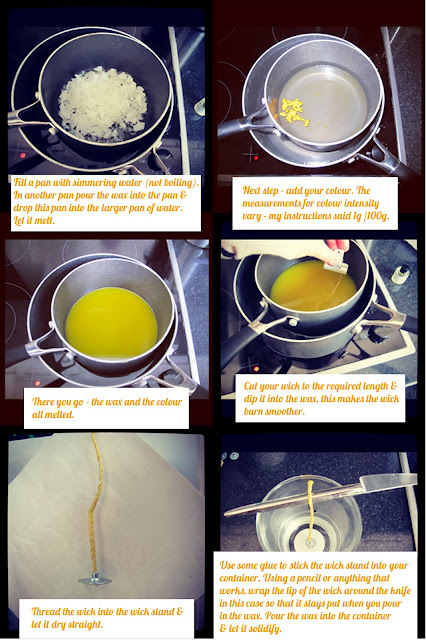 The post Candle Making Fun – A Tutorial appeared first on Tea and Crafting.